Grosse Ile Massage at The Lotus Studio is a place to come to relax and receive advanced bodywork therapy. We offer stress relieving massage treatments, on the beautiful island of Grosse Ile. We are located inside Grosse Ile Hair Studio at 8026 Macomb St. The therapist, Kimberly Beattie Aller, was born and raised in Downriver, Mi. She attended Gabriel Richard High School, and received a Leadership scholarship to attend Loyola University, New Orleans. She graduated with a BA in Communications in 1993. After college, Kimberly taught elementary school at a prep academy in San Francisco. While living in the Bay area, she became interested in the healing arts. In 1998, Kim graduated from Health Enrichment Center, in Lapeer, Michigan. After this initial massage training in Michigan, she studied Traditional Chinese Medicine. Shortly after this TCM training, Kim moved to Sedona Arizona. For almost a decade Kim worked at one of the most prestigious destination spas in the world, Mii Amo at Enchantment Resort. It was at Mii Amo spa that Kimberly deepened her skills in guest services with over sixty different treatments the menu offered its guests. 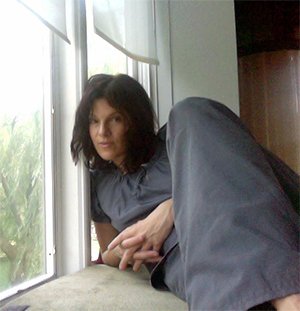 Kim was known at Mii Amo as one of the best female therapists to see for deep tissue, Japanese shiatsu, reflexology, and Ayurveda style treatments from India. Kimberly now lives in the area with her daughters, Kaya and Ava. She is excited to bring her knowledge of massage to the beautiful island of Grosse Ile, offering custom treatments for her clients at affordable rates.